Q. Of all your wins here at Roland Garros, where would you put this one? RAFAEL NADAL: Well, when you have a win and you win the trophy, it's more than when you win and you keep half. You are finalist only, no?But, well, was a real emotional match, that's the real thing. But both of us, we played for a lot of moments at very high level. So these kind of matches make the sport big. I lost similar one in Australia. Today was for me.So happy the way that I played, and more than happy the way that I fighted in the fifth set after losing big chance in the fourth. So that's probably the most difficult thing to do it, and I did. Q. Just take us through. So you're up a break twice in the fourth set; he starts playing great. You're down a break; he's playing great, very aggressive. Beginning of the fifth set, then it seemed like you finally found your offensive game towards the middle of the fifth set and then sort of pushed through. RAFAEL NADAL: Yes. Well, both breaks for me in the fourth was against the wind. I had to serve against the wind. I didn't have the break and serving with the wind like happened in the third.For example, when you have a break you need to win the next game to convert the break. If not, you don't have an advantage. So happened the same as in the second that I had the break up, but another time against the wind. Djokovic have special things in these moments, no, special shots.His return is amazing. He's able to increase a little bit his level sometimes in these moments, and that puts you in very tricky situation ‑ and especially if you are against the wind.So I know when I had the break. I am not ‑‑ in the fourth I know I have a chance, but the match is not over. Different feeling will be if I had the chance to serve in the other side of the court that I feel that the match is in my hands.But in that part of the court I feel that the match is not 100% in my hands. So that makes a difference mentally. Like this I played a few great points. The 15‑All was a great point; the 30‑15 was an amazing winner with my forehand.And then I played a little bit too aggressive in that moment with my forehand, no? I hit two good ones, but the third forehand I tried to hit a winner and I had a mistake. Then he played a few good games, good points. You know, when you save a situation like this and you arrive to the tiebreak with this special feeling, you come back from a situation like this, normal thing is the player who is coming from behind have better chance on the tiebreak, and that happened. Q. Were you surprised when you had a warning for time violation and then when you had the point penalty? And do you think the tennis should have a shot clock like in basketball so that it's clearer for all the players? 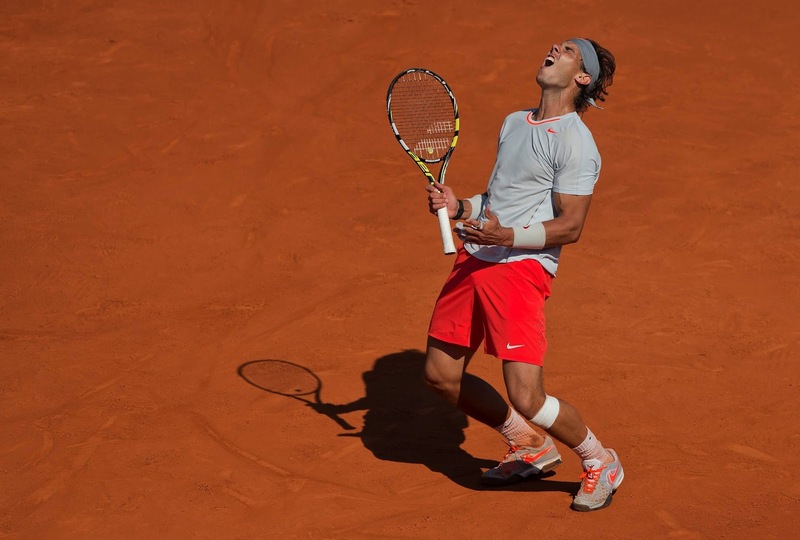 RAFAEL NADAL: I was not surprised. Is something usual. Not the penalty point, but the warning, yes. I would say is not the day to talk about that, seriously. Much more important things to talk.But to watch a show like we see out there today, we need time between points. That's obvious. I don't like the rule. I am not agree with the rule.But is a rule, and I respect. Q. Any great champion has to have great strokes and a great mind and tremendous conditioning, but also talk up, please, about the role of courage or will or, I don't know, even love of the game, how does that come into a great champion? RAFAEL NADAL: I think all of these values are important, but I will say something that is really special for the game. You need to love the game. When you love the game, you love what you are doing. You appreciate what you are doing in every moment.You know, I learned during all my career to enjoy suffering, and these kind of matches are very special. You don't have the chance to play these kind of matches every day.So when these kind of matches happens you suffer, but I really enjoy these moments, no? I really enjoy suffering, because what's harder is when I am in Mallorca last year and I had to watch these kind of matches on the TV.Today I am here. So you can lose, you can win, and that's part of the sport. That's the good thing about the sport. That is real. That's the good thing.Everybody likes the sport because what you see is what it is. One win; another lose. Sometimes one; sometimes the others.But is real, and that's the beautiful thing. Q. Do you concentrate just on the next point or do you watch your opponent when he misses an easy volley, his reaction and stuff like this? RAFAEL NADAL: In these kind of moments, these kind of matches, I worry about myself. I don't have lot of time to watch at the other side. I try to always find a solution for me. You know, you feel sometimes when the opponent is in a tough situation, but is something that you feel. Is something that you don't ‑‑ I don't watch the other side of the court, no?I try. I try and I do. I am very focused about what I have to do, because what the opponent does, I don't have the control that. But what I am doing really have the control of that. Q. This was a fantastic match ‑ 9‑7 in the fifth; it's a semifinal, but you had 9‑7 in the fifth versus Roger Federer in Wimbledon. Did you ever think about this? Did you ever think that was the same score, final score, in the fifth set in a great match? And also, Fransson denied Djokovic the right to water the court. What do you think about that? And were you expecting also to have ‑‑ sorry about that. Were you expecting also to have sanctions if you were having a time violation once more? Because you would have lost one game, no? RAFAEL NADAL: No. Just one more point. RAFAEL NADAL: I forgot the first question. Q. 9‑7, Federer, Wimbledon. Coincidence? RAFAEL NADAL: Yes. That's all. No more than a coincidence. No. Second thing, I cannot answer you nothing about the put water on the court, because I don't see normally in the middle of the set putting water on the court on clay. I didn't see that in the past.And I watch Novak asking for that. I don't feel it was slippery. But everybody is free to ask the things. Is completely great. Is completely right that Novak ask for that. I didn't want water on court.The umpire asked me if I want water on court. I say not. Seems like the rule ‑‑ I didn't know nothing about that ‑‑ but seems like the rule is both players had to be agree on put water on the court if it's in the middle of one set.So I just receive question from the umpire, and I say, I prefer not. But if they put water, I would not say nothing against.